The final title of the six books on my Summer Classic Film Book Reading List is James Harvey's ROMANTIC COMEDY IN HOLLYWOOD: FROM LUBITSCH TO STURGES. 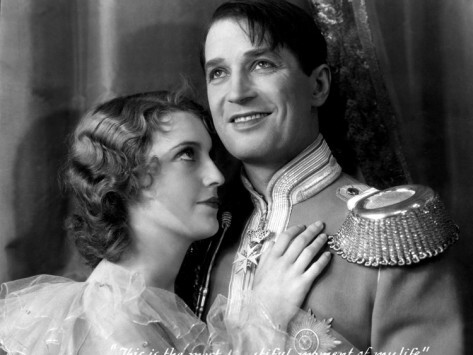 The first filmmaker whose work Harvey reviews in his lengthy tome is director Ernst Lubitsch, and the first of Lubitsch's movies discussed is THE LOVE PARADE (1929), starring Jeanette MacDonald and Maurice Chevalier. I happen to have purchased the Lubitsch Musicals Criterion Eclipse DVD collection on sale quite a while back, but I hadn't yet opened it up -- so many movies, so little time! -- so I was inspired to watch THE LOVE PARADE in conjunction with my reading. I actually saw THE LOVE PARADE on a big screen as a teenaged film fan, as part of a marvelous Lubitsch series at the Vagabond Theater in Los Angeles in the late '70s. I also saw ONE HOUR WITH YOU (1932), CLUNY BROWN (1946), and THE LADY IN ERMINE (1948), all of which are happy viewing memories decades later. And what a great movie education they all were, seen at that age! While I've been able to revisit CLUNY BROWN and THAT LADY IN ERMINE in recent years thanks to Turner Classic Movies and Fox Movie Channel, the Eclipse set is my first time to return to the MacDonald-Chevalier musicals first seen at the Vagabond. 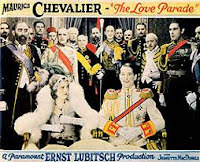 THE LOVE PARADE tells the story of unmarried Queen Louise of Sylvania (MacDonald), who falls in love with rakish military attache Alfred (Chevalier). The couple quickly marry, but then Alfred struggles with boredom in his empty role as Prince Consort, and the battle of the sexes is on. Will Louise ever recognize Alfred as her "King"? At 107 minutes the movie runs just a tad long, but there's so much fun in it that seems like a minor quibble. The movie is filled with clever and -- this being a pre-Code -- surprising moments. Jeanette is absolutely adorable in the last ten minutes or so, especially her line delivery when she lies to her husband that there's a mouse in her bedroom. The film's conclusion leaves a big smile on the viewer's face. This movie is definitely time well spent. 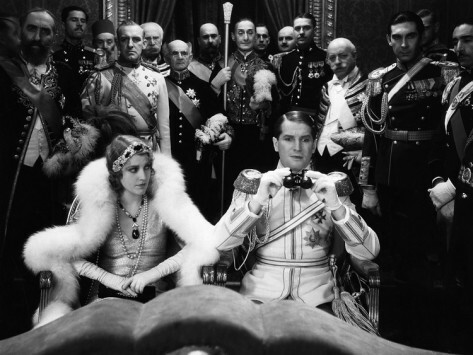 This was Jeanette MacDonald's film debut, the beginning of a memorable screen career which would last for two decades; in addition to her beautiful soprano, Jeanette was a gifted comedienne, a talent utilized by Lubitsch to great effect. She would star again with Chevalier in ONE HOUR WITH YOU (1932), THE MERRY WIDOW (1934), and the greatest of their films, Rouben Mamoulian's LOVE ME TONIGHT (1932), then move on to her long, successful series of films opposite Nelson Eddy. 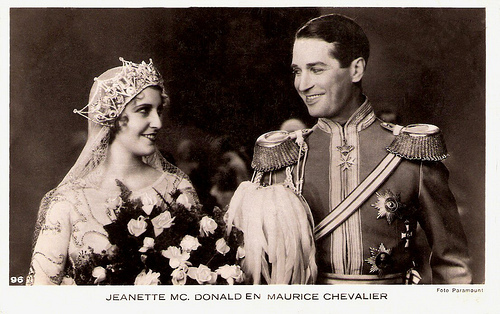 Chevalier isn't really the draw for me in these early musicals -- he's just not my type, though it's nearly impossible to imagine the movies without him, and he was nominated for Best Actor for THE LOVE PARADE. I do enjoy his changing expressions in the final scenes of the movie as he persuades (manipulates!) Louise into seeing marriage his way. The things I really love about these movies are the music, the comedy, the "Lubitsch touch" (or the "Mamoulian touch," in the case of LOVE ME TONIGHT), the supporting players, and darling Jeanette. My favorite moment in the movie is a scene brimming with movie magic. Queen Louise, having fallen in love with Alfred, sings "Dream Lover." The song seems about to come to a close, but then the Queen's ladies in waiting and soldiers pick up the chorus as they stroll the castle garden. As the music surges, Jeanette has a look of such transcendent happiness on her face that it brought a tear to my eye. A beautiful moment as the music and actress combine for something truly special. In fact, it's worth noting that this movie was one of the earliest examples of the "integrated" musical on film, where the songs move the plot forward and convey the characters' thoughts and emotions, rather than being theatrical type production numbers. 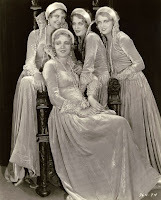 A young Virginia Bruce has considerable screen time in a tiny role as one of the Queen's lovely ladies in waiting; she's seen here in a picture of the Queen's attendants. Lillian Roth (I'LL CRY TOMORROW) is a lot of fun as a maid who shares a comic romance with Alfred's valet (played by Lupino Lane, cousin to Ida Lupino). A surprisingly slim Eugene Pallette, who had been in movies since 1913, is prominent as one of the Queen's cabinet members. And when Prince Alfred arrives at the opera, check out the blonde applauding him from an opera box -- it's Jean Harlow! THE LOVE PARADE was nominated for six Academy Awards, including Best Picture and Best Director. The Criterion DVD can be rented from Netflix or ClassicFlix. THE LOVE PARADE has also been shown on Turner Classic Movies. Laura, must admit 'The Love Parade' is not one of my favourites, though I do love Lubitsch and also like Chevalier and Macdonald. I'm interested to hear that you are reading James Harvey's book, as I've also been reading it very slowly over the last couple of years. I think he is a wonderful writer and gives endless food for thought. It has taken a long time because I like to watch as many of the films he discusses as possible, and many of them are not available in the UK so I often have a delay as I track something down! I'm now nearing the end, with just a couple more Sturges films waiting to be watched. Anyway, will be interested to hear what you think of his book. Hi Judy and Jane! Such fun that you have both been reading the Harvey book!! I'm enjoying it much more than his MOVIE LOVE IN THE 50S -- he really loves these films and makes them come alive on the pages. I'm trying to plow through the book steadily so I can finish and review it by next weekend, when the Summer Reading Challenge comes to an end, but then I'm going to be backtracking and watching more of the movies. 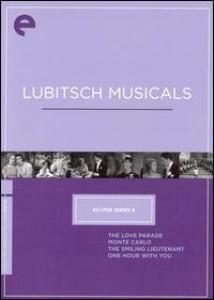 I'm keeping my Lubitsch Musicals DVD set next to the TV after enjoying his comments so much; it was an enriching experience to see THE LOVE PARADE again after reading Harvey's insights. Thanks to you both for sharing!! I've love to know more about what you think of the book as well. Perhaps you'll share more thoughts with everyone when I post the review? !